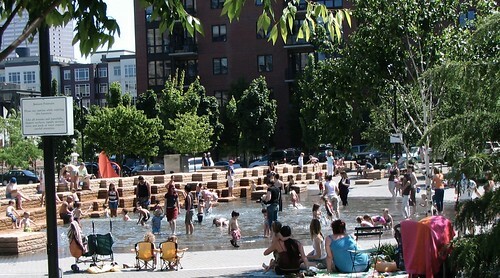 We wrote before on how small urban parks can help draw families into compact neighborhoods, specifically mentioning the great parks of Portland’s Pearl District. In addition to parks, the Portland Development Commission has worked to create affordable housing in the area. A local developer commented that at one point, there had been about 6,000 new units built since 1994, and 1,800 of them are affordable housing. The school space will be leased from a new 138-unit building that will consist of mostly two- and three-bedroom units designed to attract young and growing families. The combination of a great public realm (consisting of parks and a vibrant street life), a dedication to affordable housing as well as the city’s streetcar serving the neighborhood is all combining to make the Pearl a place for kids. For those cities wanting to create the same, these appear to be some main ingredients to success. BluePond fully supports your work in attempting to make outdoor spaces into inviting and compelling resources for all age groups. We are working to bring lifelong wellness into the built environment, and it is clear that sustainable buildings are not enough. More attention has to be paid, from a business and policy point of view, about the multidimensional benefits of linking great outdoor spaces with enhanced health and quality of life.